He would have to be living on a different planet not to be aware that the “migrant crisis” is a crisis indeed: not so much for the migrants who have everything to gain if they can smuggle themselves into Europe, but it’s obviously a crisis to their European host countries who have everything to lose if the migrants should succeed in gaining a foothold here, and, in the process, force their alien values and culture upon us. Mr Birrell, in the startling epigraph quote above—unavailable online but found in the Daily Mail hardcopy edition of 31 December 2018, p.15, under the headline ‘Myopic May damages our nation’—was in fact referring to the 139 illegal immigrants, mostly from Iran, who were caught sneaking into Britain during the Christmas period this year. His sympathies lie with them entirely. He regards then as heroes for surviving torture and oppression in their own countries, for braving the storms and treacherous tides of the Mediterranean, and for slogging their way over mountain passes and through inhospitable enemy terrain in immense caravans of misery, finally to fetch up in the icy waters of the English Channel in a last desperate attempt to get to the land of their dreams—the glorious shores of Great Britain. 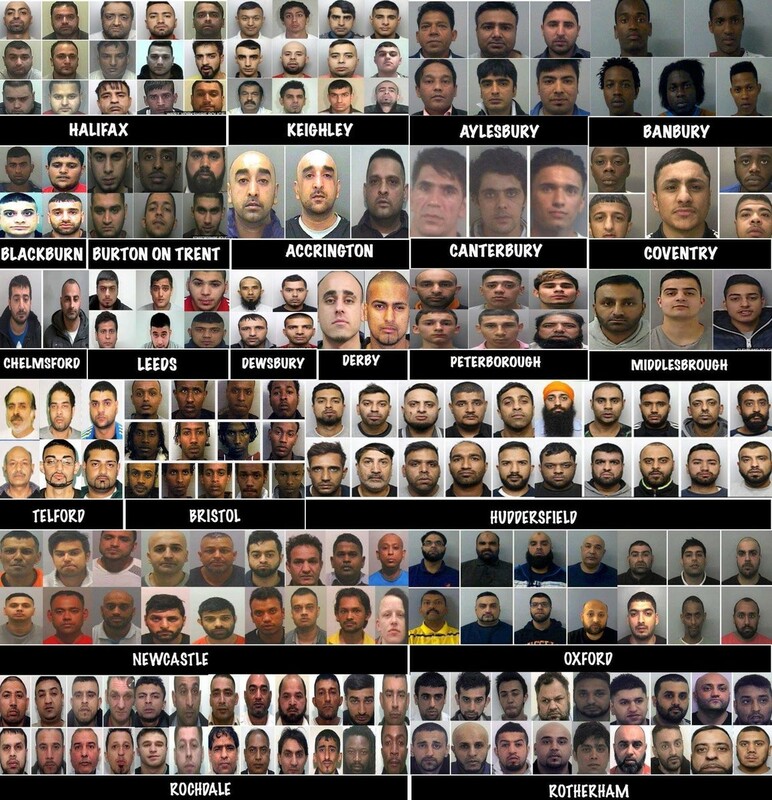 Apart from Matteo Salvini, there is not a single influential politician anywhere in Europe who is lifting a finger to stop this ongoing invasion of our homelands by hordes of African, Asian, and Middle Eastern migrants, all claiming to be “refugees”. And it just keeps getting worse. During the festive season more boatloads of illegal immigrants were welcomed into Britain by an inept and dysfunctional British government, most of whose MPs are incidentally “Friends of Israel”. These so-called “representative of the people” seem to bend over backwards to appease the powerful Jewish lobby here, ignoring the wishes and diktats of this small minority at their peril, a situation not unfamiliar to our equally pressured American confrères. 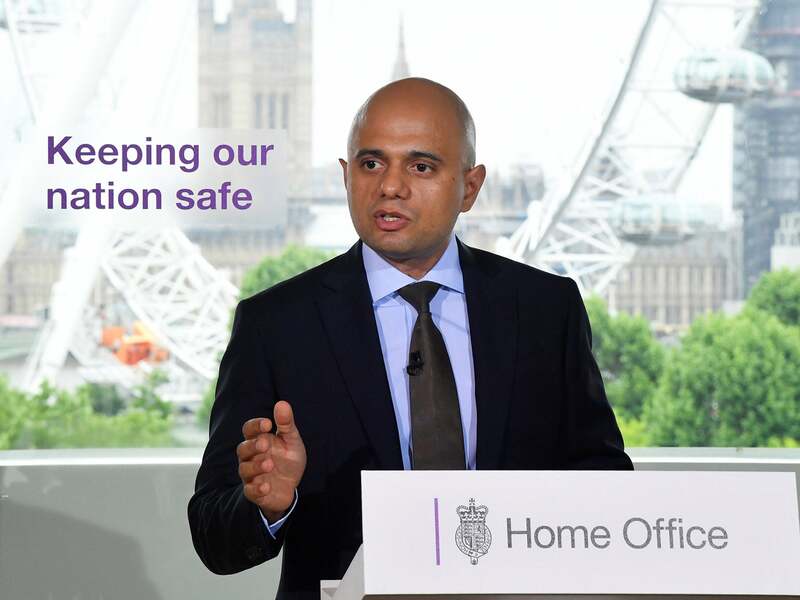 The man in charge of dealing with the migrant crisis in Britain, Sajid Javid, is himself the offspring of a Muslim immigrant family of Pakistani origin. (See his picture here). His other credentials for dealing with the migrant influx, which he has done nothing remotely effective to limit or discourage so far, are his obsequious loyalties to the state of Israel. A long time supporter of the Conservative Friends of Israel, Mr Javid has endeared himself to Jewish interests by declaring in 2012 that of all the countries in the Middle East he would like to settle in permanently, his first choice would be Israel. That’s where his Utopia lies, his Promised Land of milk and honey. Only in Israel, he says, would his children feel “the warm embrace of peace and liberty.” The problem, of course, is that he can’t prove Jewish ancestry. Would that Britain had analogous laws. The alternative government-in-waiting, led by Labour leader Jeremy Corbyn, widely reputed to be “anti-Semitic” and pro-Muslim, would be just as bad (if not worse) if it ever got into power. This party of the left, purportedly founded to look after the interests of the working classes, is even more committed to multiculturalism and mass Third World immigration than the rival Tory party. The “migrant crisis” in Britain actually began under Tony Blair, the mendacious war criminal who founded “New Labour”, and it has continued without intermission under successive British governments ever since. Only today this headline (unavailable online) appeared on page 2 of the Daily Mail, 14 January in large, bold-face type. CORBYN: I WANT TO KEEP OUR BORDERS OPEN TO MIGRANTS. This from the “Workers’ Party”, the party whose members voted overwhelmingly for Brexit in June 2016 in an unprecedented referendum in which 17.4 million Brits insisted on an end to uncontrolled mass immigration and the enforcement of the strictest border controls. The deliberate wreck of the British referendum vote by the political class in this country calls to mind the German poet Bertolt Brecht’s scathing comment, “Would it not be easier for the Government to dissolve the People and elect another?” Just substitute “import another” for “elect another”. The phrase “migrant crisis” has recently taken on an entirely different connotation here. If you think this means that there are too many migrants landing up uninvited on our shores, and that they need to be stopped, you are wrong. “Migrant crisis” now means failure to rescue more illegal immigrants on the high seas, ferry them to safety, and bestow them with benefits; in effect, to collaborate with the people smugglers and act as a delivery service for their illegal cargo. Pathological altruism, it seems, has no limits to its absurdity. More patrol boats are needed in the Mediterranean Sea and in the English Channel, it is being argued, not so much to form a protective armada or shield against dangerous invaders, but to serve as lookout points for any illegal immigrants found thrashing around in choppy seas—their boats wrecked or overturned—and to rush to their assistance at once before they drown or freeze to death in the icy waters. So how do the politicians respond to this crisis? — By letting in more people from the same unstable countries that bring in the rapists. Take a look at the map below. 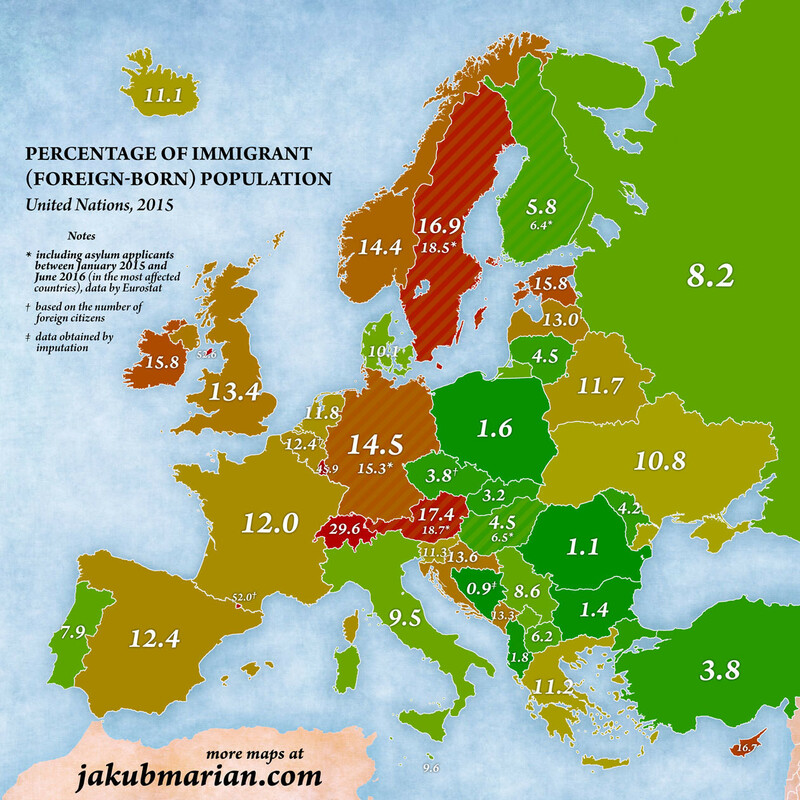 It shows the huge percentage of foreign-born immigrants in each European country roughly three years ago. Every single European country has, at least until recently, thrown open its borders submissively to this tsunami of refugees. The only countries in the EU to offer a spirited resistance to this invasion by foreigners have been the Visegrad countries (Czech Republic, Poland, Hungary, Slovakia) and now Italy as a result of the heroic activism of Matteo Salvini, resulting in ongoing battles with the EU bureaucrats. I will not discuss here the complex reasons for their exceptional behaviour, except to say that I approve of it and wish these heroic activists good luck. These official UN figures highlighting the migrant crisis in Europe for 2015 are demonstrably an underestimate, since they fail to take illegal immigrants into account. In any case, the figures have increased substantially since then. Every year since 2015 has seen a steady rise in Third World migration to Europe, with 2016 showing the most spectacular jumps — with an estimated 1.6 million “refugees” being admitted to Germany alone under the watch of the demented Angela Merkel. The next step can be described as ‘Operation Invade Europe’. Theoretically, the 28 countries of the European Union could solve the refugee problem by agreeing to accept at least one million refugees each. This quixotic scheme for sharing out misery equitably, like each participant in a suicide banquet nobly agreeing to eat an equal slice of the poisoned cake, is of course risible, but it is exactly the sort of formula advocated by Merkle and the EU and rejected by the Visegrad countries. How to deal with this endless horde of economic migrants posing as helpless “refugees”? If they are not to be classified as “invaders”, as they would definitely be in Jewish-dominated Israel, the word “invasion” ceases to have any meaning. Is violence in self-defence justifiable if failure to act decisively threatens one’s own survival? This is the ticklish question that will have to be tackled sooner rather than later. It cannot be dodged or deferred indefinitely. The Camp of the Saints has never gone out of print, and has been translated into all major European languages—and yet the coverage of the European “migrant” crisis goes on as if it had never been written. The masses pouring in from Syria, Afghanistan, Iraq, and a host of African countries are doing exactly what Raspail predicted. They will come in endless waves until they are stopped, and if they are not stopped Europe will die, just as it does in The Camp of the Saints. Raspail is playing safe. He is not advocating the mass extermination of illegal immigrants. He is simply pointing out matter-of-factly: When push comes to shove, we won’t have the guts to stop the Third World invaders. We’ll chicken out. We’ll just let them in, wringing our hands like pathetic wimps. And the result? Our own extinction. Because of our cowardice in adopting a false sense of morality—a morality which is intensely promoted by our hostile elites—our doom is sealed. In our current environment, playing the race card is enough to silence anyone who dares to suggest we should get tough with the illegal immigrants who threaten our values and our way of life. It was enough to destroy Enoch Powell. Yet at no point did Powell preach violence. 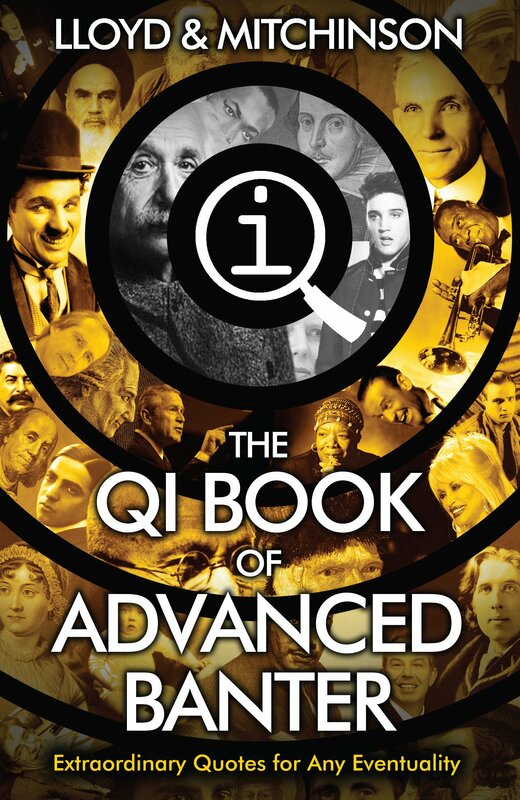 He simply predicted there would be “rivers of blood” one day if drastic action were not taken to clamp down on Third World immigration before it got out of hand. In the words of the Evangelist: Mundus totus in maligno.—The whole world lies in wickedness. Compared with what they were like after WWII, or even in the 1960s, both Europe and America now resemble open wounds. Europe lies prostrated, unrecognisably traumatised by the migrant invasion, and America has become a vast wasteland of the spirit. At least 20 percent of the 185,853 asylum applications made by nonwhite invaders pretending to be refugees in Germany during 2018 were lodged on behalf of babies born in that country that year—indicating the extent of the Third World colonization of Europe which is under way. The figures, presented by Interior Minister Horst Seehofer in Berlin, showed that in total 1,630,730 nonwhites pretending to be refugees lodged “asylum” claims in Germany from 2015 to 2018. The 206-2017 “Migration Report” issued by the Bundesamt für Migration und Fluchtelinge (BAMF, or Federal Office for Migration and Refugees)—which is the latest printed report available from that office—said that around 1.5 million people moved to Germany in 2017 alone. However, of that number, 67 percent of arrivals came from another European country, with Romania leading the pack. How many of these are Gypsies is impossible to tell, as no government institution tracks such numbers. At the same time, in 2018, more “refugees” were transferred from Germany to other EU member states than ever before, according to an Interior Ministry report obtained by German daily Süddeutsche Zeitung. Some 8,658 “asylum-seekers” who were required to leave Germany did so between January and the end of November 2018. The previous year, 7,102 were deported to other states. The deportations follow the EU’s Dublin III rule, which states that the country where a “refugee” first entered Europe is responsible for handling his or her application. According to Süddeutsche Zeitung, Germany made 51,558 requests in the first 11 months of 2018 to other EU countries that are party to the Dublin III agreement. Of these, some 35,375 were accepted. Italy was the first destination for deported “asylum-seekers,” with almost one in three being sent there. On the other hand, Hungary received none of the “refugees” deported in 2018.